Wrinkles and fine lines may appear due to a combination of factors such as aging, stress and sun exposure. Botox is proven to be an effective treatment for wrinkles. 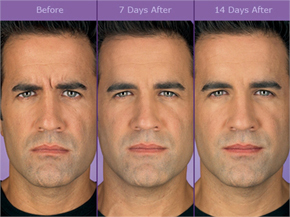 It is a popular treatment that has been used to maintain a youthful look. Botox can create a smoother appearance by minimizing motion wrinkles and lines caused by facial movement such as frowning and smiling. Aging: Decreased production of collagen and elastinmay cause the skin to appear looser with more-pronounced lines and wrinkles. Exposure to ultraviolet rays: Ultraviolet radiation may cause the skin to wrinkle prematurely. Repeated facial expressions: Facial movement and expressions such as squinting or smiling may lead to fine lines and wrinkles. Botox treatment for wrinkles is a simple and safe procedure performed at Youtherapy. There is little or no discomfort. No sedation or local anesthetic is required, so you are able to continue with all of your usual activities directly after your treatment*. Call Youtherapy for a free consultation at 212-257-9873/914-574-2709 or email:info@skintherap.com.